While I'm not using YouTube a lot, I know that it is one of the best sites to listen to music. Just key in a band, album, artist or song name and it is very likely that you get dozens, hundreds or even thousands of results. The quality varies from official releases by studios and the artists to copies uploaded by fans. The fan uploads may display the lyrics of songs either embedded in the video itself or in the video's description while the official uploads usually don't display lyrics at all. It is a hit and miss when it comes to fan uploads either. If you like lyrics, either because you want to read the song text or sing along, you may have used one of the lyrics repositories before that are available on the Internet. Having to switch between the site and YouTube is not ideal however and a solution like Musixmatch comes to the rescue. The service is available in many different forms: as mobile apps, for Spotify, AirPlay and Chromecast, and as a Chrome extension for YouTube. The Chrome extension works right out of the box. After you have installed it in the browser it will automatically display the lyrics of songs it identified as subtitles on the video itself. While it won't work with every music video out there, it worked with a wide variety of videos ranging from official music videos to user uploaded videos and even live songs. The timing is quite good as well even though you may notice a slight delay sometimes. There is unfortunately no option to change the timing to sync it with the song that is playing. I noticed this almost exclusively when I played live music videos on YouTube. You may notice that the extension does not recognize all versions of a song that got uploaded to YouTube. If lyrics are not displayed for one, try other versions of the song to see if lyrics are displayed for it. 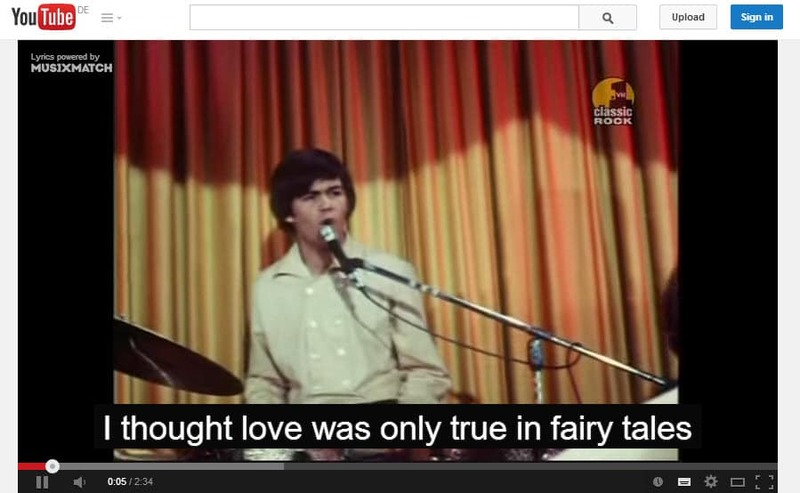 Musixmatch offers a straightforward option to display lyrics on YouTube. It works out of the box and the only requirement is that you use Chrome to watch those videos. While it has its issues, especially when it comes to song support, it is quite accurate when it comes to timings and recognition of songs on the site. The Chrome extension was criticized for injecting ads before but that is a thing of the past according to the description on the official Chrome Web Store. Should you use it? It depends. If you want lyrics to be displayed this is one of the better options to ensure that. You may want to keep an eye on the extension if you install it however considering its past. As an alternative, try Lyrics by Rob W instead. The extension is available for Chrome, Opera and Firefox. Very nice find Martin I will definitely check it out. Nice app; I just downloaded it, and it looks good and just noticed there will be Notes feature in the future! now that’s awesome! The “Lyrics for Google Chrome” extension was removed from the Chrome Web Store after the owner sold it to a malware vendor (Superfish). Can you explain what they do? Yeah. They clearly still collect personal data, and they still “reserve the right” to sell it to third parties. No thanks! I’ll stick to simple search engines for viewing song lyrics. I just did a cursory look at what connections were made. I didn’t anaylze the data being sent, but there is data of some sort being sent to an IP that does not appear to be related to the one used to grab the lyrics from. To make sure it wasn’t just the lyrics coming in / request going out, I killed the “extra” connection and the lyrics were still displayed. The extra connection again came back. In summary, not sure what is going on, but there is something. Given their track record of wanting to generate revenue (ie the ad injection), it really isn’t surprising they looked to less obvious ways of monetizing the plugin. Hi Rick, Nick here, from Musixmatch. Just to let you know that we’re not collecting any user data with our Chrome extension. If you have any doubts I’ll be more then happy to clear them for you. Thanks! d) Details of your visits to our site, uses of the Services, Application and of musiXmatch including, but not limited to, traffic data, location data, weblogs and other communication data, whether this is required for our own billing purposes or otherwise and the resources that you access. 2.1 Subject to receiving your prior consent, we may collect information about your computer, including where available your IP address, operating system, the referring URL, if any, and browser type, for system administration and to report aggregate information to our advertisers. This is statistical data about our users’ browsing actions and patterns, and does not identify any individual. b) to store information about your preferences, and so allow us to customize our site according to your individual interests. d) to recognize you when you return to use and access musiXmatch. 2.3 You will need to either accept or reject cookies when you log into our site. However, if you reject cookies you may be unable to access certain parts of our site. 3.2 Unfortunately, the transmission of information via the internet is not completely secure. Although we will do our best to protect your personal data, we cannot guarantee the security of your data transmitted to us; any transmission is at your own risk. Once we have received your information, we will use strict procedures and security features to try to prevent unauthorized access. a) To ensure that content from musiXmatch is presented in the most effective manner for you and for your computer. d) To allow you to participate in interactive features of musiXmatch, when you choose to do so. e) To notify you about changes to musiXmatch. 5.1 We reserve the right to deliver advertising to you in conjunction with your use of musiXmatch and utilise the processor bandwidth and storage hardware on your Device for this purpose. 5.3 Advertising may be contextual, that is it may be sent to you based on your current location or use of musiXmatch. Any opt out that you send us in relation to direct marketing communications does not apply to such advertising. In addition, you may receive advertising and promotional information or offers if you respond to a musiXmatch prompt on radio or television or in audiovisual or interactive media. I installed Musixmatch right after reading Martin’s article, but now, after reading Rick’s comments, I don’t know if I should uninstall it or keep it… Hard decision! I don’t want to set off false alarms, but this EULA doesn’t seem like the attitude towards monetizing has changed. In fact, it’s worse as you don’t see what is happening. They might not have all of this working yet, but the agreement certainly suggests that it is contemplated. Hi Rick, the EULA was all along on our website. We’re not hiding anything, we’re a legitimate business with more then 20 million people using our mobile and desktop apps. It’s up to you if you want to use the Musixmatch Chrome extension but please don’t scare other people off by making false assumptions. that’s a Chrome Extension. And probably one of the best one. If you don’t like extension go to Safari. We don’t get paid by sharing (and we don’t !!) your youtube or Chrome activities. That’s a simple extension. Unistall if you don’t like but don’t blame us about anything. Based on our Publishing Agreement with Music Publisher we have to track your usage (lyrics and video viewed) because we pay the rights based on that. Nothing else. You can take this as an official statement. Not hiding anything? You blatantly lied about collecting personal user data. And you directly state that you have no issue selling that data to third parties. With your shady past, why would anybody want to risk compromising their privacy for some lyrics that can be Googled within seconds? The fact that 20 million people use your apps is not relevant. That simply means there are a lot of naive people out there who either don’t read EULAs before installing apps, or for one reason or another, don’t care about or understand the ramifications of having their data mined and sold to other corporate entities. Nobody is scaring people off by making false assumptions. If revealing the truth about your shady business practices happen to scare people away, then it’s for good reason. Perhaps if you were more open & honest about your policies, you wouldn’t have to worry about people being “scared away” from your product. If that is all it is, why not say that in simple language in the EULA? I appreciate what you are saying Max, but your official statement here does not change the actual agreement. Until the agreement is changed to reflect your statement, I for one, will not be using the extension. As for false assumptions, I haven’t made any Nick — they are in “black and white” in your own EULA. If you have no intention of invoking parts of the agreement, then TAKE THEM OUT; otherwise, we have to assume that they have a purpose, which is what a common person would normally be lead to believe. I suspect that based on your responses here, you might have a bad case of lawyers out of control. I’m sure that I need not point out other cases where other major internet players, say like Facebook, have needed to revise their EULA to make it as clear as possible, in plain English. Confusion is not good as you leave the interpretation open to assumption by default. Rick, our EULA doesn’t cover only the Chrome extension but all of our apps and services. And, for example, in our free mobile apps we use advertising as a business model. By false assumptions I was referring to your initial comment: “they just troll your Chrome activity”. As you say, the EULA doesn’t differentiate between your products. As a result, any one or all of your offerings could do anything outlined in the agreement, without further notice to the user. This leaves the motives open to question. I’m suggesting that you may find less scepticism and more acceptance (especially given your previous ad supported version) if you are transparent. For incredibly obvious reasons, I’m with Rick on this one. The potential to be unwillingly exploited far outweighs the utility of this extension. If you aren’t going to be selling people’s personal data to third-party companies then simply remove that segment from your EULA. It’s not rocket science, folks.